For centuries, Paul, the apostle who "saw the light on the Road to Damascus" and made a miraculous conversion from zealous Pharisee persecutor to devoted follower of Christ, has been one of the church's most widely cited saints. While his influence on Christianity has been profound, N. T. Wright argues that Bible scholars and pastors have focused so much attention on Paul's letters and theology that they have too often overlooked the essence of the man's life and the extreme unlikelihood of what he achieved. To Wright, "The problem is that Paul is central to any understanding of earliest Christianity, yet Paul was a Jew; for many generations Christians of all kinds have struggled to put this together." Wright contends that our knowledge of Paul and appreciation for his legacy cannot be complete without an understanding of his Jewish heritage. Giving us a thoughtful, in-depth exploration of the human and intellectual drama that shaped Paul, Wright provides greater clarity of the apostle's writings, thoughts, and ideas and helps us see them in a fresh, innovative way. 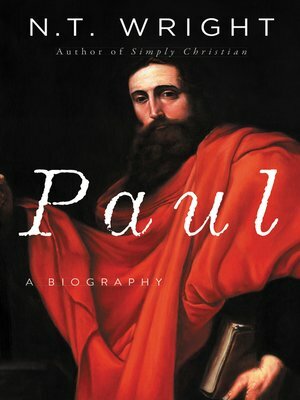 Paul is a compelling modern biography that reveals the apostle's greater role in Christian history—as an inventor of new paradigms for how we understand Jesus and what he accomplished—and celebrates his stature as one of the most effective and influential intellectuals in human history.